A bumper entry meant Tuesday at the Mòd in Fort William was one of the busiest days ever for the annual festival. Among those tasting success was local girl Claire Frances MacNeil, whose performance in the 16-18 year old traditional singing competition saw her become the first recipient of the Charles MacColl Trophy. Claire is a pupil at Lochaber High School, though she has family links to Barra. 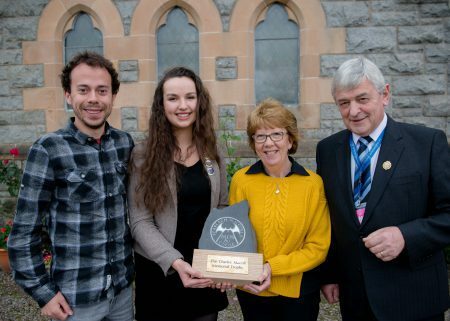 The new award was presented to Claire Frances MacNeil by Charlie MacColl’s wife Mairi, and son Calum, alongside President of An Comunn Gàidhealach, Allan Campbell. The Charles MacColl trophy remembers the late Lochaber man who for years did sterling work to encourage and develop Gaelic language, music and culture in the area. Mr MacColl was Mòd convener the last time the festival came to Lochaber in 2007. The prestigious An Comunn Gàidhealach Silver medals were won by Alice MacMillan of the Nicolson Institute and Ruaraidh Gray from Sgoil Lionacleit. 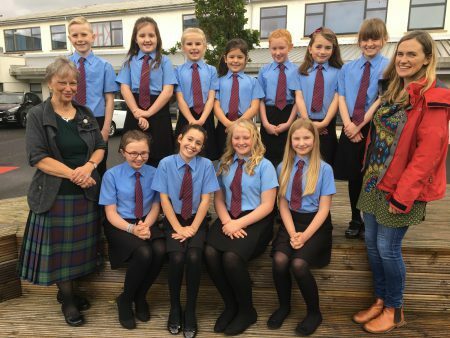 There was choral success for Nicolson, Lionacleit and the Ross-shire youngsters from Rionnagan Rois while Skye and Harris were to the fore in some of the individual competitions.